Barrie Colts and the 2016-17 OHL Awards. - Very Barrie Colts | A website covering the Barrie Colts of the OHL. Home Anthony Stefano Awards blog Lucas Chiodo OHL Barrie Colts and the 2016-17 OHL Awards. Barrie Colts and the 2016-17 OHL Awards. Yesterday the Ontario Hockey League released its list of finalists for the OHL Awards for the 2016-17 season. The list includes 7 of the leagues awards. First, the team selected OA Anthony Stefano as their candidate for the Red Tilsen Trophy which is awarded to the most outstanding player of the year. Anthony finished his OHL career with his best season production wise scoring 22 goals and adding 34 assists. He was named the winner of our Mark Scheifele award earlier this week as the teams MVP and just signed an ATO with the Elmira Jackals of ECHL. The Red Tilson award winner is selected by a vote among OHL writers and broadcasters. If Stefano wins the award he will be the first Barrie Colt in team history to win it. Here is the complete list of players selected as Red Tilson Finalists. Lucas Chiodo was announced as a nominee for the William Hanley Trophy which is awarded to the most sportsmanlike player in the league. Chiodo was 2nd in team scoring for the Colts this year putting up 22 goals and 31 assists. In 68 games this year he only served 10 minutes in penalties. In his last 168 games (regular season) he has only served 10 minutes in the box. 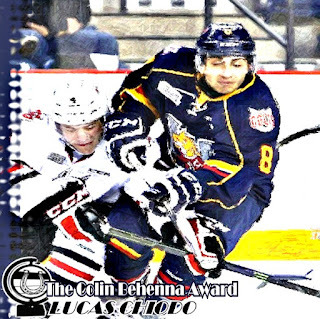 If Chiodo wins the award he will be the first Barrie Colt in team history to win it. Here is the complete list of players selected as William Hanley Trophy finalists. The OHL Awards ceremony will be held on Thursday, June 8th at the Hockey Hall of Fame in Toronto. Winners will be announced leading up to the event during the OHL playoffs. Congratulations to both Lucas and Anthony on their nominations.